And this is Charlotte's business blouse. It makes me want to go to business meetings. I love Charlotte's mussed hair here. I love her smudgy eye makeup. I'm generally way into movies/television where you can feel the temperature and air quality of the setting, especially when it's someplace that's the kind of hot and humid that makes you a little delirious. Mad Men's often really great at that, and The Paperboy's great at it too. Obviously Matthew McConaughey is the greatest smoker in modern-day cinema/whatever, but I'd so give Nicole Kidman the Oscar for Best Female Smoker, no doubt about it. Charlotte also looks great checking herself out in a compact, and makes me wish I still carried a compact. When Charlotte wears her blue dress in the bar scene, she's probably the girl that "Devil in a Blue Dress" was written about. I love her fake eyelashes, pink nails, white eyeshadow, everything. OK hi now I have to talk about Matthew McConaughey for a couple minutes, since obviously he is more important than everything. In The Paperboy he plays a newspaperman named Ward; his character is heartbreaking and tragic and reminded me of how the Beatles' manager Brian Epstein would pay boys to beat him up. He's got these scars around his mouth that are both cool-looking and terrible, and one of the sweetest things in the movie is how Ward and his brother Jack love each other so hugely and unreservedly, like they're not just brothers but also puppies. Toward the end there's a scene where they're riding a little motorboat through a swamp and holding onto each other after something bad's happened to Ward, and it's so lovely. 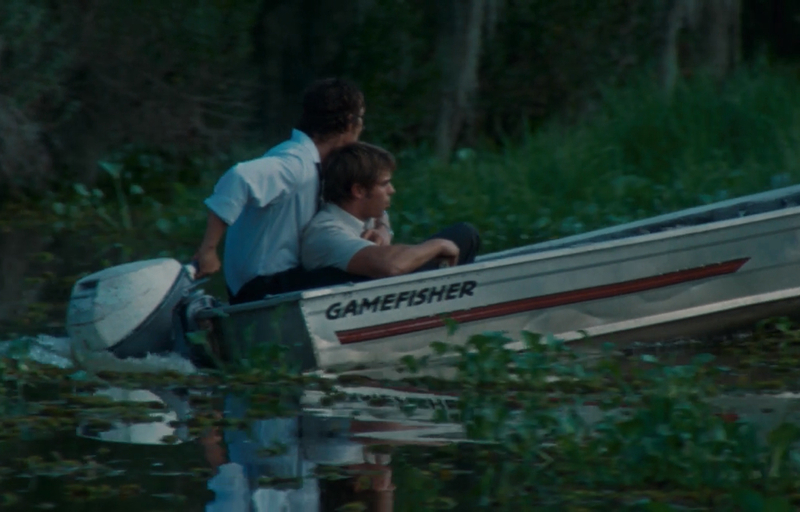 Getting kissed by Zac Efron while wearing an eyepatch on a tiny boat in a swamp is a good look for Matthew McConaughey. Also there's a scene where Matthew McConaughey eats a piece of chocolate cake while sitting on top of a dishwasher with his shoes up on the counter, wearing a button-down short-sleeve shirt that's got a bunch of pens in the breast pocket, flirting cutely with Macy Gray while she does the dishes. Their dynamic is so chill and sweet; the scene's under a minute but there's so much warmth and that sort of "easy knowledge" thing that made me get all moony about Pete and Peggy in the oyster restaurant last season on Mad Men. There's this quiet acknowledgment of a shared secret between them, and even though I've rewatched the scene about four times now, it still just undoes me and makes me want to write something even half that casually heart-melting. So that's something at least. You could totally pull off that look. I am all about this post. This movie has been very unappreciated, but it produced some great performances. I appreciate your take on this movie. I just saw it. It was heartbreakingly good. The acting = excellent. And yes, I'll never look at John Cusack the same way ever again.